This week’s mobile app for EDTECH 597 was in some ways for me the most practically related to the school experience since it was the Presidents Quiz. The purpose of the app is pretty straight forward. Create an app that allows you to make a quiz. It could be used for studying in any circumstance, I suppose, although in the example in the book, used U.S. presidents, the quiz can be adapted to any subject. In my case, I made a quiz about German Romanticism since I studied German at the undergraduate level, so that’s a subject I know a little more about. 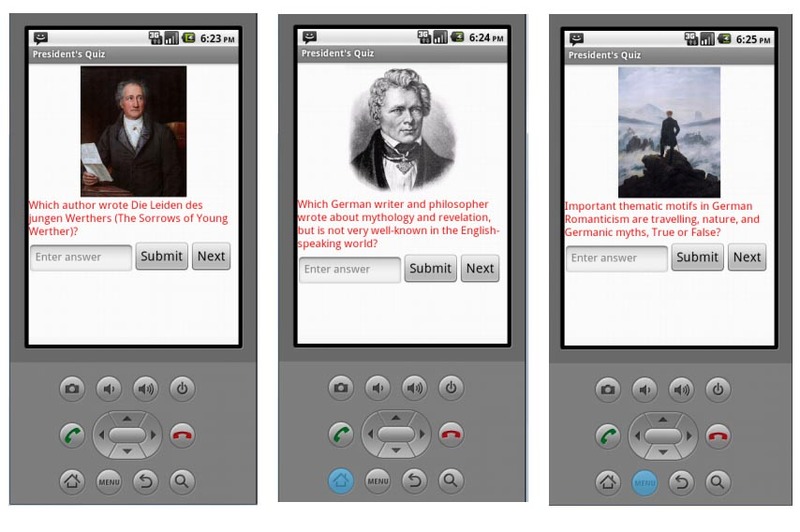 Three of the screen shots for the German Romantic Period quiz app. I picked the Romantic Period, because it was the one in which Goethe lived. He had a huge influence not only during that era, but in German history in general. In fact, there is a Goethe Institute today, and when I lived in Berlin we took a train tour across Germany to visit some media outlets like radio stations and PR departments. Because its purpose was in part cultural, the Goethe Institute paid for our week-long trip. I also selected that era, because I like the literature and the art that arose from that period of time. It was an age in which the cultural artifacts were infused with a kind of magic or mysticism, which is a component of Romanticism in general and something that appeals to my personal sensibilities as a writer. All of that said, I was reminded again that the purpose of technology for this degree is to use it to better educate people. This was brought sharply into focus for me, because in my other class EDTECH 501, we’re doing our digital divide project. For our assignment, we are to make suggestions about how a state can implement technology into the learning experience. I had pulled an article from CNN, which I spoke about in an earlier blog post for this class. It dealt with cell phones in Africa and how they are changing the intellectual landscape with education being one of the things phones will change. In Africa, people often use them in place of computers, because they’re cheaper and more mobile. And because there is enough equipment to get cell coverage so that people can access the internet. This proved to be a key component of the assignment. How do we reach students and school districts whose infrastructure really isn’t completely up to par or non-existent. Having a cell phone won’t matter if there’s no tower to get a signal. It is a more complicated issue than I originally looked at when I started this class. It still does fall under my original question of “What is the most logical end to this technology?” It doesn’t matter how good a mobile app is. If people can’t download it, because they don’t have the infrastructure then all the good that went into its development is going to be lost to a segment of the population. The digital divide addresses those who have access to technology and those who do not. It’s a common theme among not only those who work in the media, but also for people like me who look at educational technology. While on the surface it may seem irrelevant that a group of people do not have regular access to the Internet and to mobile technology, it’s become increasingly important. There are job and educational opportunities that a specific group of people will not have access to because they do not have access to online resources like job boards or lack basic computer skills like Microsoft Office, which is required for many jobs today. The people who are usually the most affected by the digital divide are those who live in lower economic conditions, non-native English speakers, and other groups marginalized by income or location. The purpose of our assignment was to make proposals that would help bridge the gap in the digital divide. We opted to focus on Idaho, because three of the six people in the group live here and because we just had a huge bill on the election ballot that in part dealt with technology in the schools. It was voted down by Idaho citizens. Initially, it was difficult to come together on the project, because none of us are used to working on a project solely online. There was also some additional challenges in trying to reduce the amount of information we had to read into an intelligible report. This caused us to have a lot of starts and stops as we waded through the materials and hammered out the details for each idea. We tried to divide the work up in terms of people’s strengths. We felt that this would save time and make the process more efficient. To that end, Bob dealt with graphics, Kathy wrote the information about the PSAs since she deals with marketing in her job. Brenda added the introduction, transition materials between slides, and the APA at the end. Greg worked on the computer lab information for both the schools and the libraries. Annie worked on this a bit, too as well as on the mobile learning unit and Internet cafes. I did a lot of the organizational tasks—it helped that I used to be a newspaper editor, so I helped break the information down into easier chunks, set at least one of the conferences we had on Google Hangout and helped edit the overall presentation. I also contributed the information about the proposals we rejected. It made sense for me to do this since I live in Idaho, and I was following Proposition 3. I learned a lot about working remotely and about working in groups with this project. Everyone had a great sense of humor, which helped a lot! Also assigning tasks according to skill levels also helped. One of the things that I would recommend for the future is that the person doing graphics not be bombarded with information. Initially, everyone’s slide information was going to go through me, but in one of our meetings, we decided that everyone should have access to it. It made sense to do this since everyone brought great insight into each slide. However, it was a bit confusing to the person putting everything together since soooo much information was thrown his way. I also would recommend looking into some project management software for future tasks. I use this kind of software for the magazine that I work for since a lot of us work remotely. It allows everyone working on the same account to access the material, but doesn’t clutter up the forum as our became toward the middle of the project as research information started coming in. Finally, I’m not sure that two weeks is enough time to really get to know people’s working styles. I’m very adaptable, but it would be a nice luxury to know what helps people and how they work best so that we could tap into this even more and at an earlier place in our work.